A backyard koi pond is one of those high-end yard installations that give your yard the perfect finish. The calm atmosphere and lovely view can turn a corner of your yard into a relaxing oasis, perfect for winding down at the end of a hectic day. Installing a backyard pond can be a technical nightmare for a do-it-yourself homeowner, so it might seem natural to talk with a landscaping company about creating a fish pond in your backyard. While they may be willing to give it a try, most landscaping companies don’t have the knowledge or experience to do the job right. It takes a pond expert to install a backyard pond that will add value to your home and allow you to enjoy your yard for years to come. A landscaper doesn’t have that expertise. Every successful fish pond holds a collection of living things, all in delicate balance. The fish, the plants, and the pond itself work together to create a complete ecosystem. Ponds built without proper knowledge of correct ecosystem balance won’t function as they were meant to, causing a wide variety of problems. Without the right balance of koi and other fish along with other creatures living in the pond, you could end up with an excess of algae, which is far from attractive. Algae can only be prevented with the right combination of water quality and chemistry, which a pond expert will know. Unbalanced ponds are also unhealthy for their occupants, causing a danger of disease or death to expensive koi and other goldfish. In a balanced pond, beneficial bacteria deal with fish waste, keeping the water healthy. Without the right balance, koi can easily die of ammonia burns from water products in the water. The only way to keep your fish healthy and your backyard pond looking good is by using filters and a pump. The filters work to remove waste products in the water, which are an inevitable result of having fish living in the pond. This helps to keep the water healthy for your koi, lowers the chance of algae forming, and helps to keep the water clear and attractive. Pumps work to aerate the water, bringing more oxygen down to where the fish can use it. While doing that, the pumps also create attractive sprays of water in the form of fountains, waterfalls, or both. An active pond with moving water is much more attractive than a still body of water, which makes a pump a critical part of the entire pond design. Local landscapers rarely have the knowledge or expertise to work with the many different types of pumps and filters on the market. It can be confusing trying to compare all the different types available and to decide which one will work best for your particular pond’s shape, size, and occupants. Without knowing the right way to choose, you run the risk of either paying for a more expensive set of machinery than your pond needs or buying machines that don’t do the job. The result, either way, is a pond that’s out of balance and a big waste of money. Every successful backyard pond includes a coordinated collection of plants, both for visual effect and for the health of the fish that live there. One thing landscapers know is plants, so it would seem natural that they could choose the right plants to complete your backyard pond. Unfortunately, the difference between dry land plants and water plants is about as big as the difference between forest trees and hanging planters. Different ecosystems, feeding techniques, and growing media call for an expert’s touch to choose a collection of water plants in and around your pond. Knowing about all these different types of plants, including how they work together to help form a complete ecosystem, is part of what a professional pond expert brings to the job. Professional pond installers are well aware of the different types of predators that hunt fish ponds in suburban yards. A koi pond can be a dangerous place for fish, tempting a wide assortment of creatures such as raccoons, foxes, herons, cats, and even bears. Your pond installer’s expertise allows him to create designs that make it more difficult for predators to fish in your pond, as well as adding touches like netting across the water to foil fishing birds in the area. Whether you’re filling a small corner of your property or creating an impressive fixture that fills half your front yard, your fish pond will only look complete if it includes a natural-looking waterfall. Waterfalls not only add visual beauty and the relaxing sound of trickling water, they help to aerate the water, making it healthier for the fish. While landscapers can be expert at building short walls and other structures with stones and mortar, it takes a special kind of knowledge to design and create a waterfall for a backyard pond. A pond expert will know the right size of waterfall to keep it in proportion to the pond, will know construction techniques for safely building the waterfall when children or pets live on the property, and even know the consequences of certain building materials on the occupants of the pond. 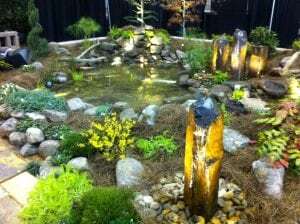 The aim of building a waterfall for a backyard pond is to create a natural looking design, one that seems as if it was formed in place by natural means. Landscaping companies specialize in creating attractive environments, but few make a point of trying to make their creations look like they just grew there in place. In this instance, perhaps more than any other, the landscaper and the pond expert stand at opposite sides of the expertise spectrum. A koi pond or other backyard pond is a major installation, designed to bring relaxation and beauty to your home for years to come. Installing a pond is a serious project that will take time and commitment, one that calls for knowledge and experience for doing the job right. When you’re ready to take the plunge and create a unique focal point in your yard, use a professional pond installer to make sure the job is done right. They’ll work with you to create a design that fits in with your architecture and other landscaping. 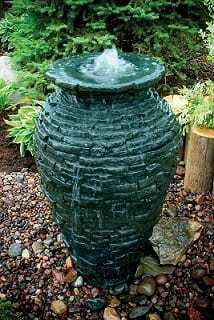 They’ll have suggestions on pond sizes and shapes, plus the materials used and the size and shape of your waterfall. A professional pond design team will talk with you about all the different types of pond plant life, and together you’ll decide how you want your pond to look when it’s finished. Pond experts know all about koi, goldfish, and other cold-water fish that live in ponds, and they can give advice on which ones would work best in your environment. Once the design is finished, your pond installer will create an attractive living corner of your yard that will increase the value of your home as well as help you to relax for years to come.